Dental hygienists are licensed dental professionals driven to improve the lives of their patients by providing quality care. While the dentists may get more press, dental hygienists probably spend the most time with patients. That’s why dental hygienists often know patients the best. You’d be surprised at how many different tasks a hygienist performs to ensure that YOU have optimal dental health. Screening patients. One of their most important jobs is assessing patients’ oral health. This includes reviewing health history, screening for oral cancer, providing a head and neck inspection, and taking a patient’s blood pressure and pulse. Taking/developing dental radiographs (x-rays). At least once a year, patients should have x-rays taken to help catch any cavities that may be developing that aren’t visible to the naked eye. Your dental hygienist provides this service to assist the dentist in the diagnosis process. Removing plaque and calculus from the surface of your teeth. Plaque is a sticky film of bacteria that can become dangerous when it hardens into calculus. Bacteria wears away at your enamel and will eventually lead to a cavity if you don’t remove it regularly through personal dental care. Your dental hygienist is there to remove the plaque you can´t get rid of yourself by brushing, flossing, and rinsing with mouthwash. Apply preventative materials to your teeth. Besides removing the harmful stuff, your dental hygienist can take measures to strengthen your teeth. For example, he or she may apply dental sealants to your back teeth, which are most susceptible to decay. Fluoride is also used to remineralize your teeth, making them more resistant to acid attacks. Fluoride application has even been known to reverse decay. Counseling patients on oral care practices. After cleaning your teeth, your dental hygienist will have a very good idea of what (if anything) you need to change in your oral care routine to optimize your oral health. He or she will give you tips on the best ways to floss and brush. Don’t be afraid to ask questions! 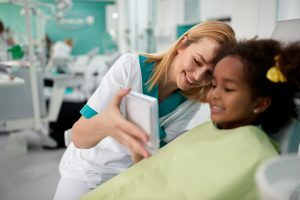 The answer to “What do dental hygienists do?” includes everything from testing to cleaning to prevention and counseling. Your dental hygienist is there to ensure that you walk out of the dentist’s office with strong, healthy teeth. Though often under-appreciated, dental hygienists are instrumental to quality patient care. Don’t forget to thank your dental hygienists for their hard work this month! Get $25 off on your first visit at Penn Dental Medicine.